Why is the All-on-4 technique a good solution at complete tooth loss? With complete tooth loss, there are basically two fundamental ways to replace the teeth: a fixed, stable replacement supported by implants, or a removable denture. There is no doubt that a replacement made out of zirconia on 6-8 implants is the best restoration of lost teeth, considering the aesthetical aspects and the comfort. 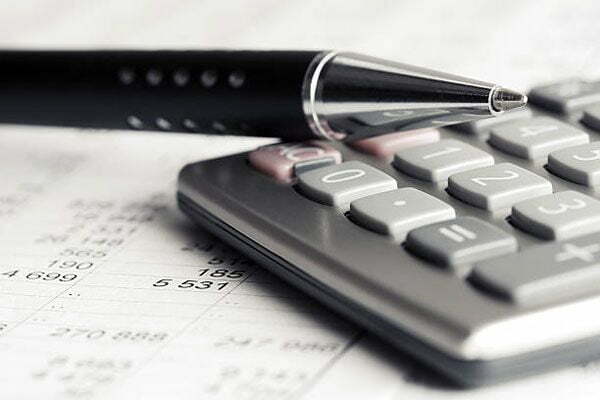 This solution is very common, but it is not one of the budget-friendly solutions. How do you have to imagine the All-on-4 concept? What is the procedure of the All-on-4 technique? What does the package of 5,500 Euro / jaw include? If you have lost all your teeth, a traditional, removable denture without any stability rarely provides a perfect solution. This denture can occasionally cause pain, is uncomfortable and often unstable, making it difficult to consume the favorite meals. 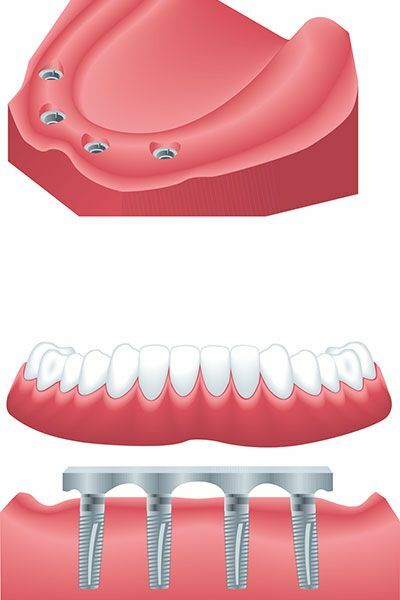 The Nobel Group has developed the All-on-4 concept for patients who have a complete edentulousness in one or both jaws. The All-on-4 system is an uncompromising solution that truly returns the feel of natural teeth. 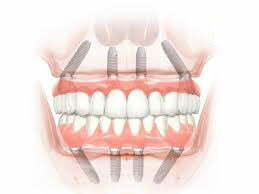 This replacement technique restores the entire row of teeth, with a screwed-in denture on four implants. It is like getting your own teeth back. The All-on-4 solution provides more stability in the bone and helps to avoid certain additional operations, such as a bone augmentation. After placing the four implants, we can even immediately use a temporary restoration to avoid the discomfort associated with not having any teeth. The final replacement is very similar to natural teeth, both aesthetically and functionally. Due to the surgical technique used, no bone graft is required. This is because the two posterior implants are placed 45 degrees in the jawbone to make the most of the bone supply. For the healing period, the patient receives a temporary denture. This denture is manufactured within four days after surgery. After 3-4 months of healing, the final, screw-retained round bride, which sits stably on the four implants, is manufactured. This is then fixed onto the already exposed, with implant abutments fitted implants. This treatment also requires four days. After completion of the treatment, the patient can then fully enjoy the meals again. 1. A good and cost-effective alternative to removable dentures, so that the patient receives a stable, comfortable teeth replacement. 2. It is an excellent procedure even if bone loss is present, as it can be performed without any bone graft thanks to the angles of the implants. 3. Significant cost savings through a lower number of dental implants and saved treatment interventions. If you have lost or will lose all your teeth, and the unstable, conventional denture is not the solution for you, and if you have a limited budget, this concept is definitely right for you. Request an individual offer today!